We talked about how he could earn money and I said he could do extra jobs around the house for set amounts and it really appealed so we’re giving it a go. He’s never had pocket money from us, his Granny has started giving him pocket money though and the first thing he wants to do is go and buy more Lego, we could open our own shop with the Lego he has! 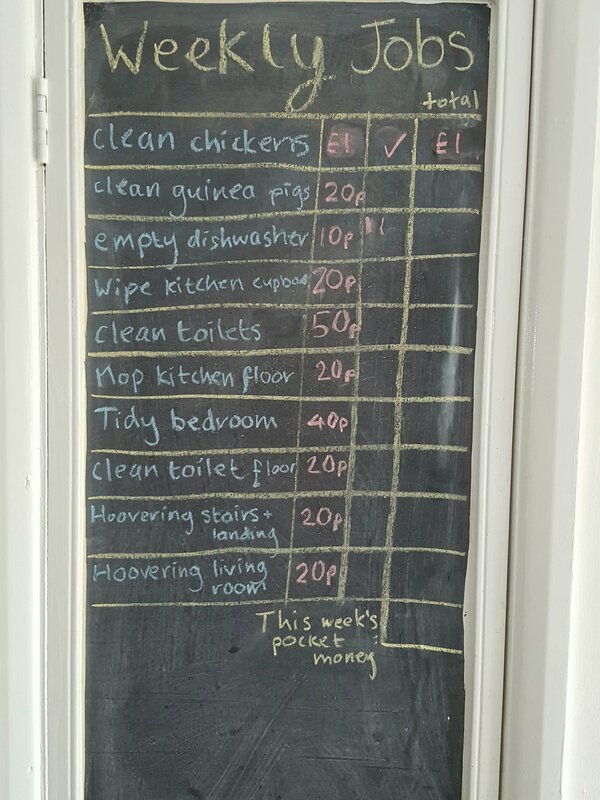 We compiled a list of extra jobs he could do each week around the house. There are some jobs that he doesn’t get paid for, like tidying up his toys in the living room and collecting the eggs from the hens, they’re just things he has to do. It was interesting to hear what jobs he added to the list, such as cleaning the toilet! Some jobs are once a week only, such as the toilets and the chickens but others he could do every day, like emptying the dishwasher. Giving him the control of what he does works well with his oppositional defiance, it’s his choice what he does, he seems to get a great sense of achievement in doing tasks, which will be great for his self-esteem. And this way he determines how much pocket money he gets on a Saturday morning himself and he also has to add it all up himself, getting a bit of arithmetic in there, sneaky Mama. But he has the potential to earn just short of £5 a week, I suspect there might be a tip for good work to round up to the nearest £1.